Whoa! This is FANTASTIC. I can see why it would be addictive. And don’t you think doing colorwork in the round is easier? It’s the only way I can even do it. Reading charts back and forth just confuses me. I love tube scarves! I won’t be stopping you. 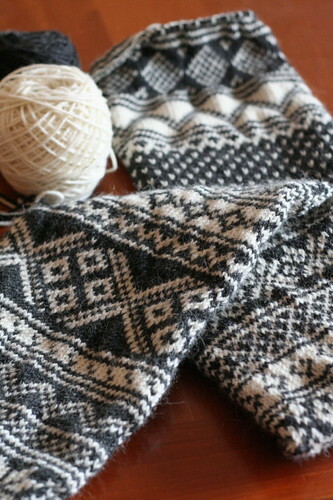 I actually cast on for my first fair isle attempt yesterday and I’m HOOKED!!! Holy smokes I love it! I can’t believe I waited this long to try it. Love the scarf its going to be super warm! Ooh, I love this! 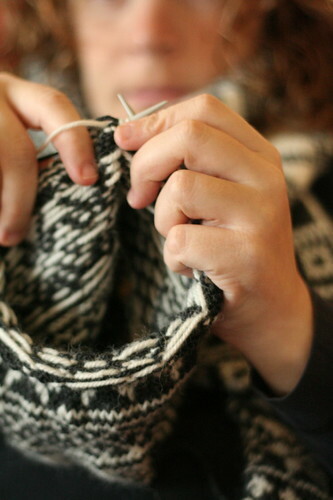 Will you be publishing the pattern when it’s finished (fingers-crossed)? 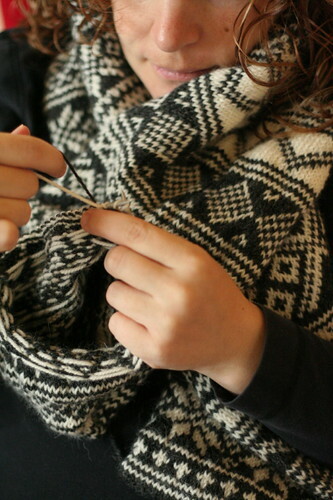 I like the tube – purling in colorwork is tricky and although you could steek and then line the back, I think the tube is good because then the scarf can be wrapped any which way and still be right-side out! Wow! Beautiful. I hope you’ll publish the pattern, i’ll want to make it! You? Lazy? I think not. That scarf reminds me a lot of the one on a Meg Swansen video, and of course I can’t remember the name of it, but I think the original pattern she had is Swedish. Or possibly Norwegian. Anyway, she does 2-color work and knits in a tube with ends like kitchner toe, so all the carried yarn is hidden inside. She makes a hat like it, too. I need to watch that again because she has this ingenius way of hiding the jogs. What are you doing about that, by the way? It is gorgeous, absolutely gorgeous. Very time-consuming but well worth it. That’s a lot of peeries! I only said that because I like saying “peeries”! I would also hope you write this one up to sell. I’d buy! No way I would never stop you knitting, your too inspiring! What a great idea. 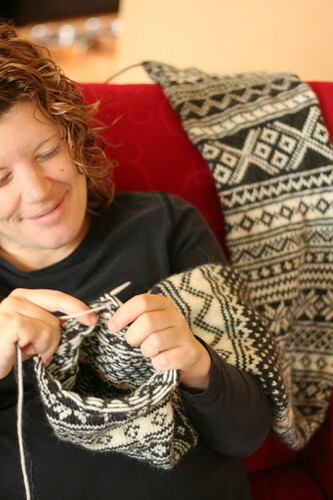 I recently got Alice Starmore’s book of fair isle knitting, what a fun way to go through some of the patterns in her book, and then I hae another book of patterns, and oh my goodness! I’ve got to buy more yarn! That is an AWESOME scarf! That’s awesome! What a great idea. love the charcoal-cream combo. actually, i really like the photos on your site in general– maybe the light? The Tapestry mitts look sublime. Most Awesome Scarf Ever. I love it in the black and white! Love this scarf. Please publish this pattern! Elinor, you are an amazing knitter. The scarf is too beautiful for words! That is the greatest idea for a scarf! It does look amazingly complicated! That scarf is amazing! Your colorwork is lovely. What kind of cast on did you use? did you use a provisional cast on or something else? Your instructions aren’t clear and everytime I try it your way it turns into a knot in each side and you didn’t specify the kind of cast on you used. I’m close to just doing a provisional cast on because it’s the only way I know how.